TheGrio has launched a special series called #BlackonBlue to examine the relationship between the police and African-Americans. Our reporters and videographers will investigate police brutality and corruption while also exploring local and national efforts to improve policing in our communities. Join the conversation, or share your own story, using the hashtag #BlackonBlue. 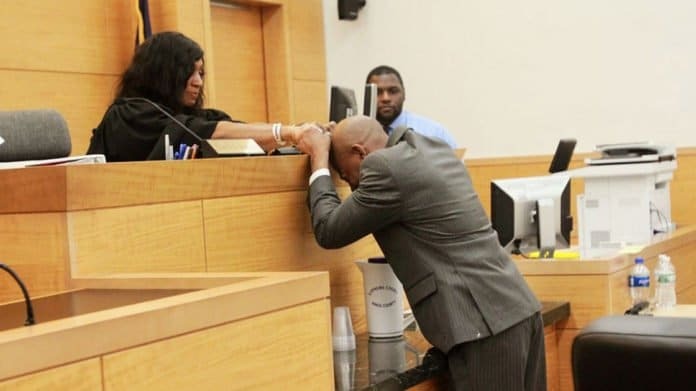 John Bunn was brought to tears as he finally received justice and was freed 17 years after being framed by police and convicted of murder. “They won’t admit I’m an innocent man,” 41-year-old Bunn said in a Brooklyn courtroom, flanked by his attorneys. Evidence showed that Bunn, who was 14 at the time, and another man were framed for the killing of Rolando Neischer by a corrupt former New York City detective Louis Scarcella. 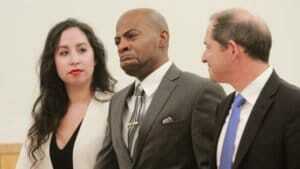 Bunn was only 14-years-old when he was convicted and jailed, reports NY Daily News. Bunn was convicted in an August 1991 killing, largely based on evidence planted by Scarcella. He lawyers always maintained that he was framed. Brooklyn Supreme Court Justice Shawn’Dya Simpson, who overturned the conviction based on the evidence, was overwhelmed with emotion herself because of the circumstances that led to Bunn being jailed at such a young age. Simpson said the legal process failed him. Bunn is optimistic about his future ahead. “I don’t know how I made it this far, but I believe I am here for a purpose,” said Bunn. “I just want to be proven innocent. . . . I didn’t want to be in the dark side of the shadows they (the prosecutors) tried to put me,” said Bunn.